PI4 – PharusIgnis4 is a digital modulation (MGM) for beacon purposes. It is an ideal digital modulation that is compliant with the IARU Region 1 VHF Committee accepted 1 minute mixed mode beacon sequence. The name PharusIgnis4 comes from the ancient words for beacon, lighthouse and fire – Pharos (from Greek to Latin pharus and coming from the Lighthouse of Alexandria on the island of Pharos), Ignis (Latin: fire) and 4 for the four FSK tones. The OZ7IGY Next Generation Beacons transmit in a 1 minute cycle starting at the full minute. The colored line below illustrates the mixed mode sequence where P indicate pauses. The CW is sent at 60 LPM/12 WPM. First it sends PI4 (call sign), that last 24 1/3 s, a subsequent pause of 2/3 s, then at the 25 s sending CW identification (call sign and locator), followed by a 500 ms pause and carrier until the 59,5 s followed by a 500 ms pause until the end of the cycle. The resulting waterfall and decoding in PI-RX will look like the screen dump below. To decode a PI4 signal you will have to set your receiver to the same frequency as of you would do to receive a beacon with an 800 Hz carrier. The receiver bandwidth should not be less than 1 kHz. On most receivers you will have to set your USB dial 800 Hz lower than the nominal frequency, e.g. OZ7IGY is assigned to transmit on 50,471 MHz thus the receiver must be tuned to 50.470.200 to show a 0 Hz frequency deviation. When you receive the carrier at exactly 800 Hz then you know how accurate your station is. To decode PI4 you can use PI-RX by Poul-Erik, OZ1CKG or MSHV by Christo, LZ2HV, that runs on both Linux and Windows. Michael, DG0OPK, has MSHV running on a Cubieboard2 decoding PI4. PI4 decoding of OZ7IGY and carrier measurement using PI-RX by Poul-Erik, OZ1CKG. PI4 is specifically designed with beacons and VUSHF propagations in mind. It is far more robust to path irregularities and equipment inaccuracies than e.g. WSPR and JT9 that both also would require a long sequence. 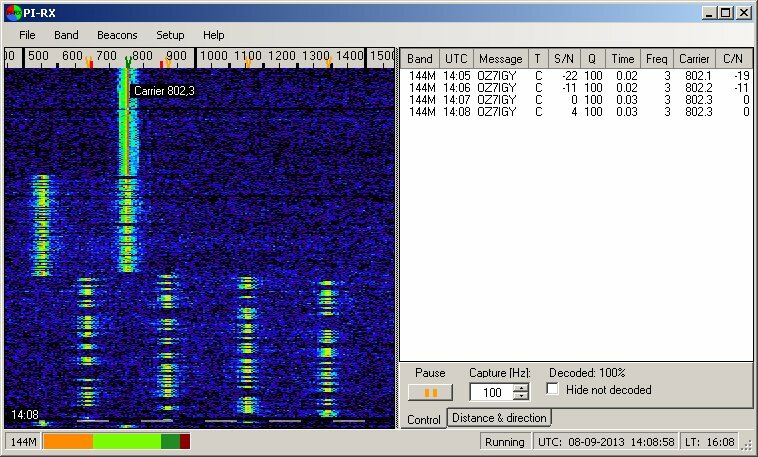 JT65 modes are in-between WSPR/JT9 and PI4, and JT4, when it comes to robustness but cannot fulfil an identical sequence every minute without other sacrifices unless using the JT65B2/C2 submodes. The JT4 submode JT4G has better path robustness than PI4 but takes about twice as long to transmit thus it will not fulfil the sequence requirements. PSK2k, FSK441, JT6M, JT9-fast, MSK144 and ISCAT are all “fast modes” but are not as sensitive as the other modes. Because of this is PI4 the MGM used by the OZ7IGY Next Generation Beacons. The PI4 + CW + carrier sequence has also been chosen as the sequence for the IARU 50 MHz Synchronized Beacon Project. In the pipeline: DB0MMO (10 GHz), GB3ANG (144 MHz and 1,3 GHz), IW9GDC/B (144 MHz), OH1DB (10 GHz), OZ4BHM (144 MHz), TF1VHF (144 MHz) and WA1ZMS/4 (70 MHz and 144 MHz).